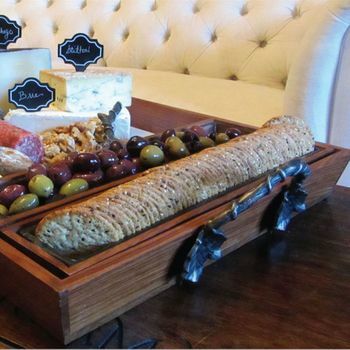 Add elegance and style to any dinner table with this unique Serving Tray Handcrafted in California's wine country from authentic vintage oak wine barrels. Crafted by hand, each displays the original imprint of the winery of origin - so no two are alike. Each is moisturized with butcher-block oil and coated in bee's wax as a finish, keeping it food safe. From appetizers to entrees, it will create an eye-catching centerpiece for your next party. The tray is finished with hand-turned iron handles - which make it easy to carry as well as decorative. Also makes a unique gift!